When Ravenous Chupacabra enters the battlefield, destroy target creature an opponent controls. VampiricTooter on Golgari Guild Kit Commanders? 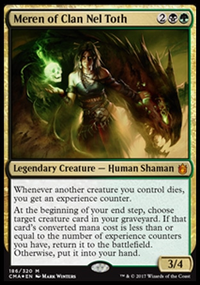 Savra is and excellent Golgari commander and not as over play as some. Having a Dictate of Erebos in the command zone can be ruthless. 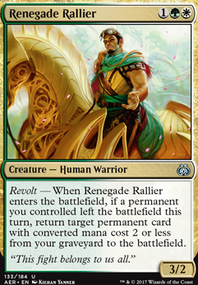 Combined with creatures like Ravenous Chupacabra you can pretty much keep your opponents creatures out of the battlefield. but, i changed it to Dimir, running a play-set of each of the cards i mentioned and honestly it took awhile for me to lose. 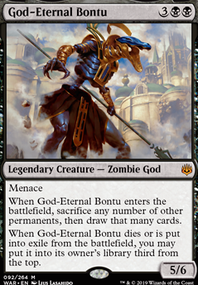 Crap hands happen, so there were some things i simply couldnt answer, like a handful of mono-red aggro decks and a orzhov deck that beat me to a pulp. otherwise when i start discarding their cards they usually concede, and if they dont i'll break out the Doom whisperers or Ravenous Chupacabra and beat em to death. The battle I've always had with heartless decks is that without it a lot of the deck becomes dead weight. Semblance Anvil does a bunch to fix that, but it still hits some major headaches in the reliability front. To combat that, I'd look at making a backup plan- personally I'd run Slag Fiend and Zombie Infestation to give a 'none of this is helpful, I'm gonna hit you in the face' option, but that can be less than appealing when you have to make the choice turn two on whether to abandon your hand entirely. There are fifteen sideboard slots to look at- a transformative board is very possible, with things like Ravenous Chupacabra and Avalanche Riders offering a lot of value to face down graveyard hate. redbird97 on Advertise your STANDARD deck!
. I've been working on this deck for a while and am sure there are still weaknesses. The problem is one cannot address all problems. 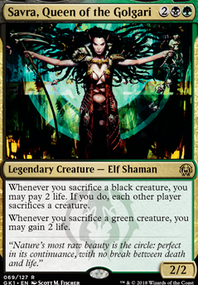 My sideboard has Vraska's Contempt for the expected increase we'll be seeing in Planeswalkers. I have Ravenous Chupacabra there for if I'm playing against a guy who's running big creatures. My main questions are Pilfering Imp over Hired Poisoner and perhaps drop Divest and Duress for something else. As with anything, when you make a recommendation, let me know what needs to be dropped. BTW I've won too many games because of Mark of the Vampire so that stays! Thanks in advance. I don't think Circuitous Route is what you want in this kind of deck. It doesn't do much late game/mid game when you're looking to stabilize with a threat. Jadelight Ranger could do you some good here. Bedevil seems like it would be tough on your mana base. You might want to throw some Assassin's Trophy into the mix there. 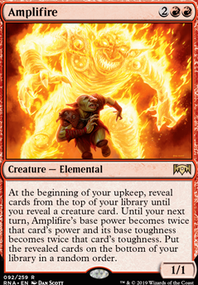 Also, Plaguecrafter would go nice as a 2/2 split with Ravenous Chupacabra and would help game one against control. Beast Whisperer is a card I've been testing recently. 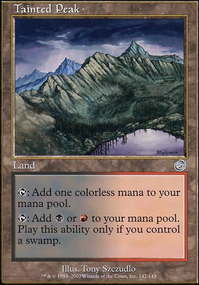 It's there mainly as an alternative 4-drop to Vannifar, as well as being something to tutor up in the 4-mana slot when you don't need to Ravenous Chupacabra or Hostage Taker anything. Also the deck is a bit lower curve than previous builds so I was testing it because of that as well. All in all it's a pretty powerful card that demands removal, but I'll probably end up cutting it for something else.